For a run-down on the previous week, including this pick-up, the Tyler Moore trade, Justin Upton news, Mike Foltynewicz, and more, read my column from today at atlantabraves.about.com. Many people applauded the Braves re-acquiring lefty Eric O’Flaherty on Sunday, but is there much to praise beyond just having a familiar face around? 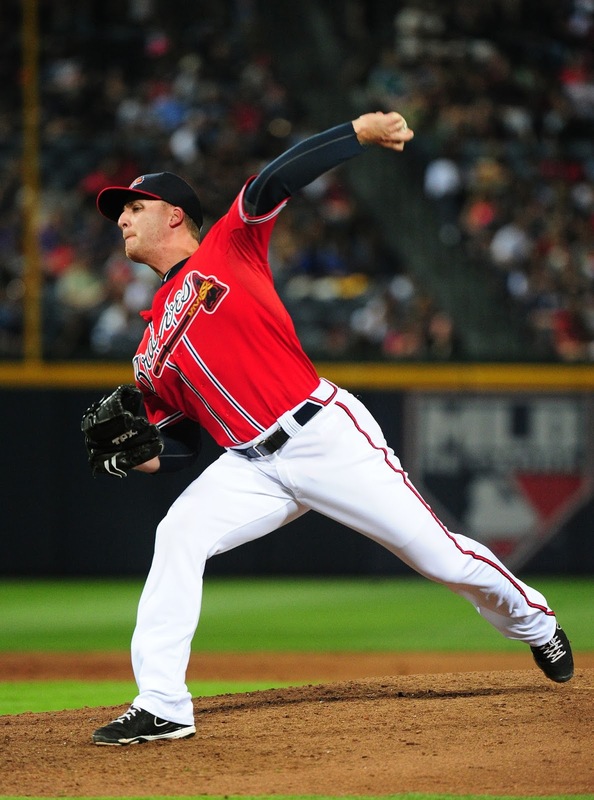 Can O’Flaherty resemble the pitcher who was so good for the Braves from 2009 until injury ended his 2013 season prematurely or are the Braves wasting their time on a flier who has lost the skillset that made him valuable? 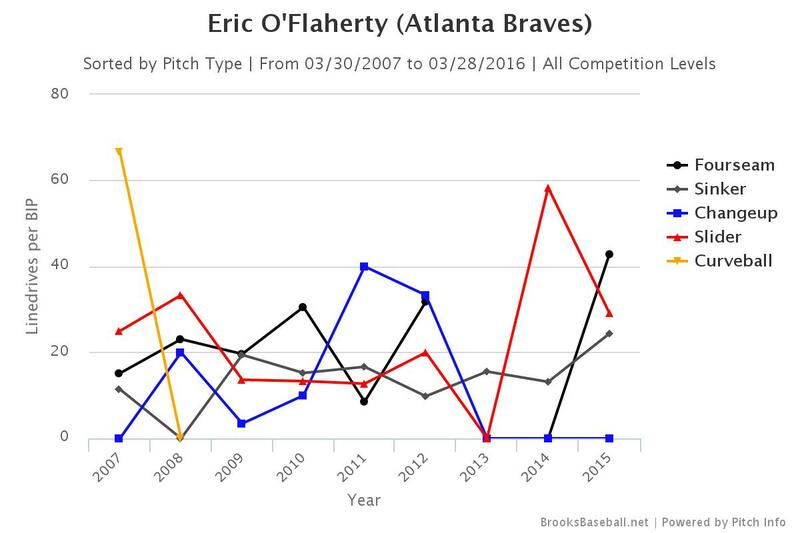 When O’Flaherty came to the Braves via a waiver claim after the 2008 season, he was a fastball/slider pitcher who mixed in the occasional curve or changeup. Atlanta quickly cut into his fastball usage by getting him to utilize a sinker and by 2011, it was his most-used pitch. He liked it so much that he began throwing it so often that he used it half of the time or more by 2012. And it was a quality pitch. He still threw his slider at a similar rate to his M’s days (25-27%) and simply stopped throwing his four-seam fastball as much. He also scrapped the curveball and nearly did the same with the changeup, leaving him almost entirely as a three-pitch pitcher, but a sinkerballer for the most part. The tangible results were excellent. His groundball rate climbed north of 55% with a spike of 66% in 2012. While not a strikeout pitcher, he was getting into the 7 per nine range. Sabermetrics were often not thoroughly impressed with him because his K and BB metrics were never golden, but considering he was maintaining his success despite good (but not great) FIPs, it became a situation where we took into account the pitcher O’Flaherty was rather than who he compared to. His injury in 2013 led to Tommy John surgery and a trip to free agency, where he signed with the Oakland A’s. Has he been a different pitcher? Oh, yeah. Ignore the high ERA for a second. He’s lost a tick in velocity (from about 92-93 mph to 91-92 mph) on his fourseamer and his slider has lost about 2 mph. Not significant losses. The lost downward movement on his fourseamer and sinker is concerning, though. His slider has also began to come in on a plain and stay there rather than drop 1.5-2 inches. I’m not seeing a significant change in release point so it might be downgraded stuff and/or feel. O’Flaherty has never really relied on stuff – especially against lefthanded batters. His biggest weapon was deception. He hid the ball well against lefties which gave the impression that the ball was jumping out of his hand. As he progressed, his sinker helped neutralize right-handed batters to allow O’Flaherty to shake the LOOGY label. With its effectiveness limited, O’Flaherty is again vulnerable to right-handed batters. Here is a graph showing vertical movement. His changeup has dropped off the map, which isn’t advantageous because hitters generally will allow it to float out of the zone because of decreased velocity. 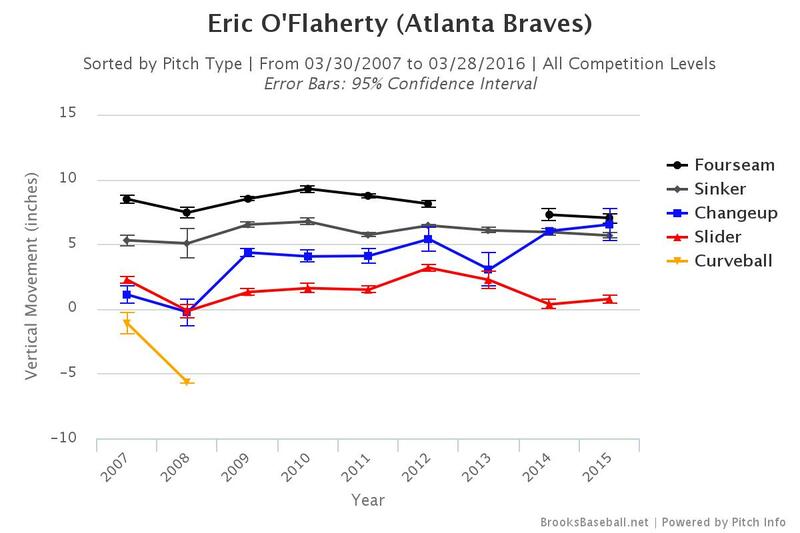 Diving in deeper – starting in 2012, O’Flaherty was getting the ball in the zone with increased infrequency. During his first three years with the Braves, he kept the ball in the zone about 50% of the time according to PITCHf/x. Even though he had a great season in 2012 (3.27 FIP, 3.31 xFIP), his Zone% fell to about 42%. This also coincided with increased usage of his sinker and the two go hand-in-hand. He also had the movement to get outside-the-zone swings and hitters were swinging at what could be considered balls 35% of the time. Subsequently, they were making a bit less contact. If you are going to live outside-the-zone, you must entice batters to swing at those pitches. O’Flaherty was able to do that in 2012, but not so much in 2014 and especially last year. Further, because his sinkers and sliders were losing downward movement, they often became fodder for hitters to pummel in-the-zone. Last year, he saw the highest amount of in-the-zone pitches swung at of his career. Unsurprisingly, he also saw the greatest amount of in-the-zone contact. Hitters simply were not missing. They also weren’t hitting dinky pop-ups. Last year, O’Flaherty gave up a 22.6% line drive rate. That’s 4% over his career rate and the highest of any full season of his career. 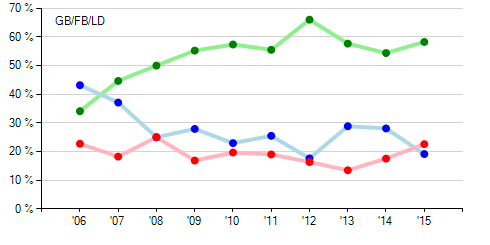 In the above graph, flyball rates are blue, ground-ball rates are green, and line-drive rates are red. Line-drives are bad for pitchers because nearly 70% of them become hits. Increased line-drives means more baserunners. More baserunners means worse pitching. Worse pitching means we lose. In the following graph, pay special attention at how many line drives O’Flaherty saw off his most-used pitches. Chances are that O’Flaherty won’t be dinged with a .388 BABIP again (his career norm is .292) and there is reason to suspect he should be better against left-handed batters than he was in 2015 (.274/.358/.319). Plus, as I wrote before, I like Alex Torres, but not in the LOOGY role that he likely would have performed as if he was the sole lefty in the pen. Of course, Torres might not even make the roster, but if you are going to have a guy like Torres, you need a lefty specialist and O’Flaherty might be that guy. (ed. Torres was reassigned shortly after this post) But it’s important to realize that the O’Flaherty that worked so well with Craig Kimbrel and Jonny Venters is probably not the guy the Braves acquired on Easter. There is nothing to suggest that the O’Flaherty who had a sub-1.00 ERA will be rejoining the Braves. Is this move more nostalgia or really filling a need? Probably the former, but Roger McDowell has done more with less before.